The Hulbert Tahquamenon United Methodist Church has been part of the community for over 75 years. Since its dedication in 1935, the church has played an active role in the spiritual and social life of the community. The log chapel has been the site of weekly worship services, Vacation Bible Schools, Christmas Programs, weddings and funerals. Small groups for Bible Study and special interests have recently been formed. The Hulbert Christian Crafters, sponsors of Hulbert Wildflower Day, began as a church craft group meeting around a member’s kitchen table. Today, as one of the seven small churches that form God’s Cooperative Parish, the church is able to reach out to the local community and also serve the 2,500 square mile area that the parish includes. On the local level, food baskets are prepared for needy families at Thanksgiving and Christmas. Parish projects have included health kits for disaster victims, Christmas Shoe Boxes for children, and providing volunteers for local and out of state mission trips. Constructed of local lumber and using many local workmen, our church was built and furnished. The dedication in 1935 was the culmination of great congregational effort. To raise money to build the church, the congregation divided into 2 teams. The losing team treated the winners to a picnic lunch. In 1927, Rev. Doten came to this district as a regular minister and served for about five years. Worship took place at the town hall and at a dance hall owned by Sol Freeman. His district covered areas from Eckerman to Trenary with ten or more churches to contact every two weeks. As our congregation grew, so did the desire to have our own place of worship. Rev. Doten and Mr. Lind, the school principal, thought up the Mile of Pennies contest. It ran for one month between the red and blue groups (members divided to make groups) and at the end of the month, the groups collected more than a mile of pennies! The red group won and was treated to a Fourth of July picnic by the blue group. On July 4th, 1934, the ground breaking ceremony took place and building began. Dr. Yoeman led the dedication service in September of 1935. His sermon that night was to “Love one another, but Christ’s love is greater than all.” However, it wasn’t until 1936 that all was finished and ready. At that time, the town flourished with a wooden bowl factory, lumber mills, and logging. Many attended services and our church grew. It wasn’t unusual to have fifteen to twenty singers in the choir and for the pastor to look out and see fifty-five or more smiling faces ready to worship on any Sunday morning service. In the back could be heard the laughter of children learning the love of God in Sunday school. Later, as jobs diminished and people were forced to move, attendance dropped. Our attendance is small but the doors are still open to anyone wishing to come in. 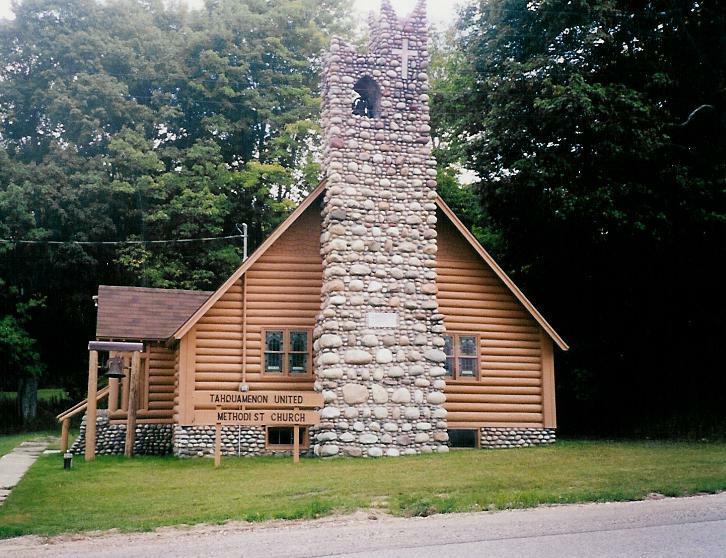 The first glimpse that you have of the beautiful log chapel that sits in the woods is of rocks from Lake Superior that were collected to erect the chimney and steeple; the bell was donated by George Isacson. The logs that greet you upon entry are from our own forest and were donated by local lumbermen. The idea of reversible pews came from the railroad passenger cars; it gives us access to both ends of the sanctuary. Many weddings took place by the fire place. The wonderful stained glass windows were donated by families and still today, you can read their names on each window, bringing a rich heritage to this small but humble church. We have sent many young people to camp and to mission trips as our promise to help gather His flock. The Lord promised, where two or more are gathered, He would be also. Today, we are living proof of His promise and love. Even though we are small, we keep our apportionments paid and are able to pay bills. We are developing fund raising ideas as we continue to look for ways to raise money. Help keep our doors open and let us bring joy and the Holy Spirit to this community for years to come. What we ask of you today is to love our Lord and to keep the Christian faith alive. Help us replace our roof and fortify our walls. Thank you and God bless. Mission of the year 2007.